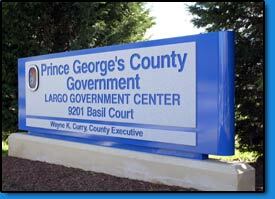 Custom Signs Washington DC | Government Electronic Signs Virginia Maryland | KERLEY SIGNS, INC. Working within the any branch of Government, one must demonstrate the utmost professionalism. After all, Government represents structure as well as service to the citizens of this country. Kerley Signs employs only those with the highest level of craftsmanship and professionalism, helping to deliver a product that is unrivaled within our industry. Our signs can easily form to fit your needs, and can be utilized in a variety of ways. Whether your sign is going to be mounted at the end of an entrance, hanging off of a building, sand blasted, or any number of additional options, Kerley can meet your every need. Our LED scrolling signs are also extremely useful. These signs can be used in a wide variety of ways within the Government industry. These signs can effectively convey information to all who see it. Whether or not it's being used to convey emergency information, road closures, or just general information, these signs can assist throughout all branches of Government. Most Government buildings also contain a decent number of in-house employees as well as individual offices. Kerley signs also designs interior designs to help increase direction on a number of levels. With a phenomenal selection of unique styles and colors, Kerley Signs can match the design to just about any interior. Also, Kerley Signs offers the opportunity to have ADA signage installed. ADA signage aims to assist those who have unfortunate disabilities. ADA signs are usually associated with the visual impaired, as they generally contain braille. However, these signs can also help direct the hearing impaired as well as the those with mobility impairments (i.e. help finding an elevator or handicap entrance/exit). ADA signage is usually not flashy and uses features such as extreme contrasts, and non-glare backgrounds. With such a variety of opportunity why not use the services of Kerley Signs to aid in enhancing the overall effectiveness of your Government buildings and/or services.